All the experts say Juan Encarcion is done including yourself. However, I have this nagging gut feeling that benching him will kill me, for he has single-handedly saved my team in the Outfield when Griffey went down. I am more loyal to him than Griffey. My question is, Have you ever had a gut feeling on something like this, and would it be wrong to ignore the experts and go with this feeling. As I write this, I find the experts have shot me in the foot, for I benched Encarcion and he just hit another homer. I think what I said was that Encarnacion was the Cincinnati outfielder with the least trade value. I also said, weeks ago, that until the Reds could put together a trade, the Reds would probably rotate their five players (Griffey, Encarnacion, Casey, Dunn and Kearns) between four positions. Or maybe I said that’s what they should do. In any case, that’s what they’re now doing. I believe that you should never do anything because an expert says so, unless you believe the expert is right. What’s the point of playing the game if you don’t follow your own instincts and opinions? Sure, part of the fun is reading other people’s opinions. And some of that reading and listening may change your mind. But you’re playing the game. If you simply follow the lead of others you’re letting them play the game with your team, and what’s the fun in that? I happen to have Juan Encarnacion on my Tout Wars team in that so-called experts league. Twelve other so-called experts let me have him for $10, an amount he’s already earned even if he doesn’t play another game. The beauty of this game we play is the way it allows us to test out mettle and perceptions, our diligence and acumen against other worthy opponents, using the world of baseball as the field of knowledge we aspire to master. I’m happy to have you reading my writing. I don’t really cotton to being an expert, but I read a lot and think a lot and try to pass along what I know entertainingly. And I hope some time I help you and others think through a thought. But you have to play the game. Know the difference between a lutz and a flip? How about a Diamondback and a Devilray? If not itâ€™s time to dig in and Ask Rotoman. Who are the best players who are in the final year of their contracts? These are usually the guys who have a great year. You are wrong. The best players in the final year of their contracts are not usually the guys who have great years. Although sometimes they do. Somewhere around here I have a study done by someone that convinced me there was absolutely nothing to the idea. Absolutely nothing. But I canâ€™t find it. So let me run with some anecdotal info, and if anyone wants to argue, bring it on! If I have to Iâ€™ll redo the study. Last year, some of the best free agents-to-be included Pedro Martinez, Ivan Rodriguez, Daryl Kile and Jeff Blauser. And each turned in what could be considered a career year. Nice, but that isnâ€™t proof. Because last year some of the other best free agents-to-be included Kenny Lofton and Fred McGriff, who bombed. The notion of the â€œfree agency incentiveâ€ implies that ballplayers donâ€™t work hard except when cash is on the line. And while I have no doubt that in some circumstances thatâ€™s true, in most cases I just donâ€™t buy it. By the time youâ€™ve made it to free agent status, youâ€™ve already likely made millions of dollars. It would be nice to make tens of millions more, but at that level the real motivation has to be competitive. Nobodyâ€™s life changes because theyâ€™re making $7 million rather than $6 million. But perhaps itâ€™s more important to remember that players donâ€™t generally become free agents until after theyâ€™ve played a number of years. Which means theyâ€™ve grown up and are generally entering their prime years as they go for the ultra-contracts. They are at their physical and mental peaks, in general, so it shouldnâ€™t be any wonder at all that these are their best years. And, there is another factor: Have you ever noticed that sometimes youâ€™ll hear a word used you donâ€™t usually hear, some 25 cents word like, say, â€œindubitably,â€ and then youâ€™ll hear it over and over? Or youâ€™ll see a story in the paper about, say, someone choking on a fish they tried to swallow on a dare, a story youâ€™ve never heard before, and then over the next week youâ€™ll see a couple other similar stories. And naturally you wonder, Whatâ€™s up? And you think there must be some kind of a trend. Free agents successes work the same way. When you look at a list of the big free agent signings after 1997 the big names are the guys like Martinez and Kile who had monster years. Itâ€™s hard not to think, â€œIf only I went after guys in their free agent yearsâ€¦â€ But thatâ€™s because free agent busts, like Lofton and McGriff donâ€™t make the list of big signings. Their value has dropped. So, because Iâ€™m a sport, the best free agents-to-be in 1999 are reportedly: Randy Johnson, Robbie Alomar, Mike Piazza, Mo Vaughn, Bernie Williams, Kevin Brown, Rafael Palmeiro, Jose Mesa, Dante Bichette and Charles Johnson. Other interesting names are Edgardo Alfonzo, Robin Ventura, Pat Meares, Darren Dreifort, Armando Benitez, Sean Berry, Royce Clayton, Jimmy Key, Carlos Perez and Bobby Jones. Most of these guys can be expected to have good years in 1998, because they are of that age and/or skill-level where good years are to be expected. Most of these guys will also sign with the teams theyâ€™re already with, many before the season starts. But the ones who donâ€™t, who have great years and sign with new teams in 1999, will look next year like theyâ€™re really in it for the money. I’m in a rather unique league where ten teams play each other head-to-head weekly (team #1 vs. #2, #3 vs.
Game three is total of both halves. Our scoringÂ system is distinct. Batters get one point each for HR, R, RBI, SB, SF, SacB, and H. Therefore, a solo HR is worth 4 pts., due to the H, RBI, R, and HR! Are there any spreadsheet systems out there that I can use to evaluate players in both leagues based on this format? Iâ€™d appreciate any help. Current fantasy rankings available in mags don’t rate players as we score them. I run your letter simply to point out that there are a million variations on the game we love called roto (or fantasy). And, obviously, we canâ€™t cover all of them. In fact, when it comes to prices, it is hard for us to cover any of them. Every week I get mail from players of Scoresheet Baseball (they love it! ), AL Roto Leagues with 12 teams (they love it! ), NL Roto Leagues with 10 teams (they love it! ), Combined fantasy leagues with 12 teams (they love it!). Oh, you get the picture. 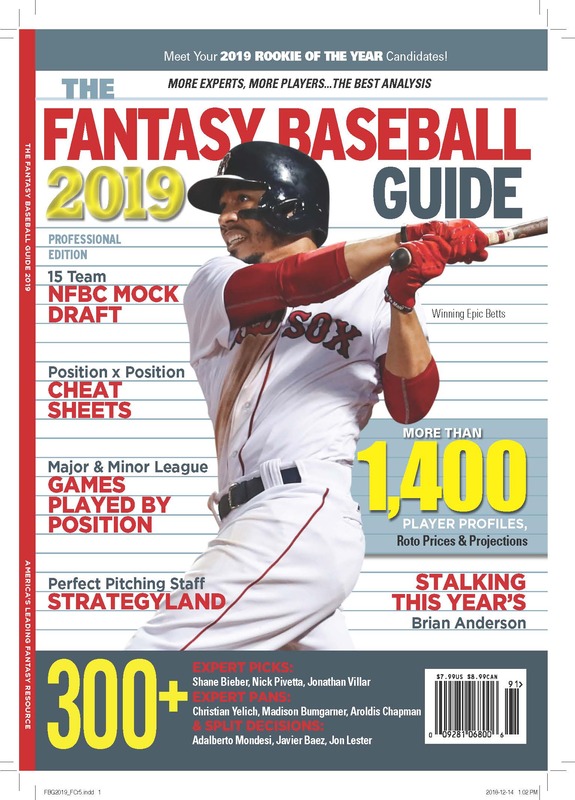 Which is great and all, but makes me shudder when I read the preseason fantasy baseball magazines with their shiny pricing systems, because I know that for most people those prices are wrong. 1-List all the players with your projections of how theyâ€™ll do in the year ahead. This can come from Bill James (good) or Alex Patton (better) or someplace else (workable) so long as the system is logically consistent. 2-Devise a ranking system to determine which players will be drafted or purchased in your league. That is, if you have a 10 team league with 14 hitters each, list which 140 position players are the best. Make sure to have enough for each position. Youâ€™ll likely end up with catchers who donâ€™t hit as well as some outfielders you canâ€™t draft. Do the same for pitchers. 3-Add up the stats of all the players you expect will be drafted in each category that counts. 4-Compare each player to the total in each category. Add up the comparisons (usually a percentage) for each player and make a ranking. 5-If you distribute players by draft, rank them in order. If you distribute them by auction, youâ€™ll have to convert their relative values to dollar values. It isnâ€™t a small job, which is why there are any number of bean-counters getting paid to provide prices. But if the prices arenâ€™t tailored to your league, while they may still be useful as an analytical tool, theyâ€™ll be pretty much worthless during the draft. Which is why coming up with your own prices is a good way to get an edge at your draft/auction. Pedro Martinez: A breakout year, a record contract, a new league. I canâ€™t think of a reason he canâ€™t do it again, albeit with an AL twist. But it was a great year and figures in the end to be one of his best. David Justice: It doesnâ€™t sound like Dave is going to be ready until May, at least in the outfield. Iâ€™m not saying ignore him, but donâ€™t expect a repeat of 1997. Jeff Frye: Iâ€™m not sure why youâ€™d sign a guy like Jeff to a three-year deal. But I know why youâ€™d like to have him on your team. He can play everywhere and most likely will. Russ Davis: He keeps getting older, which is what happens when you get stacked behind some stars and then get hurt. He strikes out too much, or maybe youâ€™d prefer I say he doesnâ€™t walk enough. Whatever. If you have him for, say, $6, youâ€™ve got a winner. Charles Johnson: Was awarded a raise from $290,000 to $3.3 million. He has a lifetime average of .241, OBP of .331. He will be a free agent next year, I hear, and is poised to actually earn those millions. Heâ€™ll do it because heâ€™s ready, not because heâ€™s in it for the money. Shawn Green: For all the years of disappointment, heâ€™s only 25 this year. Like Willie Greene he may not have been as good as some would have liked, but heâ€™ll have a fine career. Donâ€™t let him go cheap. I’ve heard some conflicting news about Arizona. Will it be a hitter’s park like Colorado because of the thin air of the desert or will it be more like the other National League ballparks. Will the retractable dome have any effect? What have you heard? Part of my strategy as a Fantasy Baseball player is to play the ballparks. I was just wondering if you knew what the ballpark for Tampa was going to be like. Is it a hitterâ€™s park or a pitcherâ€™s park or just your average stadium? Just wondering. Both the BOB and the T-Field (Iâ€™m getting pretty sick of brand name ballparks) are domed. The Diamondbacksâ€™s roof is retractable, while the Devil Raysâ€™s field is simply closed in. The ball generally carries well in Arizona, and the BOB is expected to be a hitters park. In spite of the dome the BOB will have natural grass. The idea is to leave the roof open most of the time, but cool the place down each afternoon so that itâ€™s comfortable for game time. That makes me think of rising cool currents rushing up into the hot Arizona night sky. So Iâ€™ve got Matt Williams pencilled in for 50 HR. T-Field is sized like Yankee Stadium. It has artificial turf, but will have a full clay cut out in the infield, rather than the carpet between the bases. Which should make for some bad hops on those fast-rolling grounders. From experience we know that domed parks are especially susceptible to quirks in the ventilation system. Advance word from St. Pete is that pitchers are going to like it there. Iâ€™ve got a good feeling about Wilson Alvarez, if he can get the ball over the plate. Ultimately, the mysteries of ballpark characteristics can only be explained after the games have been played. I donâ€™t think anyone knew in advance, before the Oakland Coliseum was closed in, that it would go from an extreme pitcherâ€™s park to a hitters park. My recollection is that the new Braves park was expected to favor hitters, if not quite so much as Fulton County Stadium. But last year that wasnâ€™t the case. The practical advice is favor pitchers in Florida, hitters in Arizona, but consider any sort of big edge a risky play. If you get right and Jay Bell whacks 32 homers, then you did good, but chances are the effects wonâ€™t be as extreme as they might be. And in the end there is simply too much we donâ€™t know.